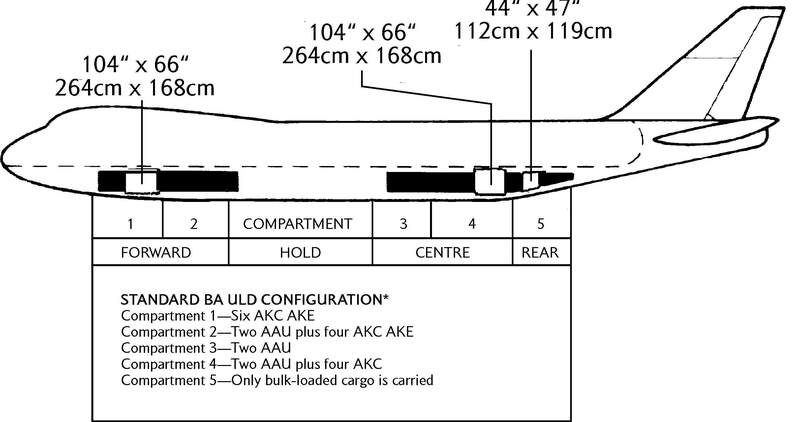 Aircraft ULD - Useful Information - 5 Continents Int'l Transport Co.
A unit load device (ULD), is a pallet or container used to load luggage, freight, and mail on wide-body aircraft and specific narrow-body aircraft. It allows a large quantity of cargo to be bundled into a single unit. Since this leads to fewer units to load, it saves ground crews time and effort and helps prevent delayed flights. Each ULD has its own packing list (or manifest) so that its contents can be tracked. ULDs come in two forms: pallets and containers. ULD pallets are rugged sheets of aluminum with rims designed to lock onto cargo net lugs. ULD containers, also known as cans and pods, are closed containers made of aluminum or combination of aluminum (frame) and Lexan (walls), which, depending on the nature of the goods to be transported, may have built-inrefrigeration units. Examples of common ULDs and their specifics are listed below. Aircraft loads can consist of containers, pallets, or a mix of ULD types, depending on requirements. The table below indicates the maximum capacity of an aircraft for all-container and all-pallet configurations. In some aircraft the two types must be mixed as some compartments take only specific ULDs. Container capacity of an aircraft is measured in positions. Each half-width container (LD1/LD2/LD3) in the aircraft it was designed for occupies one position. Typically, each row in a cargo compartment consists of two positions. Therefore, a full-width container (LD6/LD8/LD11) will take two positions. An LD6 or an LD11 can occupy the space of two LD3s. An LD8 takes the space of two LD2s. Aircraft pallet capacity is measured by how many PMC-type LD7s (96" × 125") can be stored. These pallets occupy approximately three LD3 positions (it occupies two positions of one row and half of the two positions of the following row) or four LD2 positions. PMCs can only be loaded in cargo compartments with large doors designed to accept them (small door compartments are container only). The Boeing 747-400 is a wide bodied long range passenger aircraft capable of carrying approximately 20 tonnes of cargo in addition to a full passenger load, although this figure varies dependent upon the route. The forward hold (compartments 1 & 2) and the centre hold (compartments 3 & 4) are designed for the carriage of ULD’s only. Compartment 5 is for the carriage of loose cargo. *The following equipment can be used in place of the ‘Standard Configuration’ to suit load requirements and to allow interchangeability with other carriers or aircraft. - PAP/PLA pallets and nets. – PAP/PAG pallets with nets or ALP. The 777 is a wide body, medium to long range aircraft which can carry up to 14 tonnes (99.8 cu. metres) of cargo and mail. The aircraft has 5 holds (3 compartments), 4 (2 compartments) of which are designed to carry unit load devices with the compartment five (rear hold) available for bulk loaded cargo and mail. The Boeing 767 is a medium range aircraft which can carry approximately 9 tonnes of cargo in addition to a full passenger load. The aircraft has two lower deck holds comprising five compartments. The forward hold, comprising compartments 1 & 2, together with compartments 3 & 4 in the rear hold, are designed for the carriage of ULD’s, whilst compartment 5 in the rear hold is for bulk-loading only. The 757 is narrow-bodied, short to medium range aircraft which can carry approximately 5 tonnes of cargo together with a full passenger load. The aircraft has two underfloor holds consisting of five compartments. 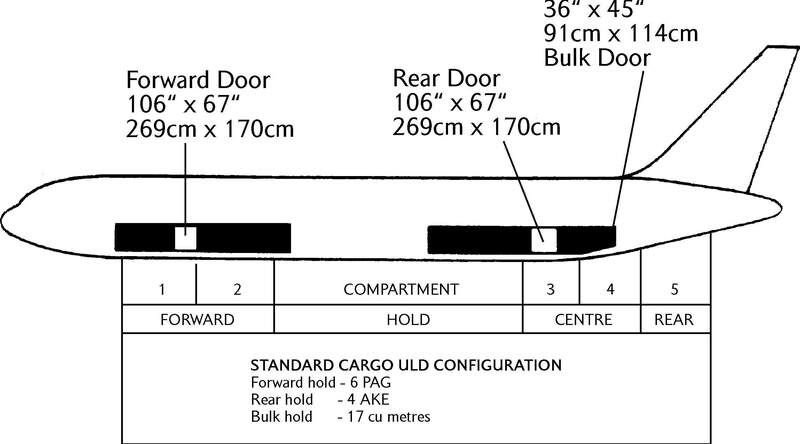 The forward hold (compartments 1 & 2) is fitted with a three-bin sled installation which is extendable from about 20“ behind the forward hold door to the rear of the hold. The rear hold is divided into two sections. The forward section (compartments 3 & 4) is fitted with a two-bin sled installation and the rear section (compartment 5) is a bulk compartment. Cargo and mail are loose loaded on this aircraft, which does not carry Unit Load Devices.